"Bergson" redirects here. For other uses, see Bergson (disambiguation). 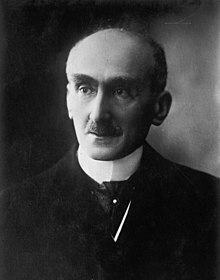 Henri-Louis Bergson (French: [bɛʁksɔn]; 18 October 1859 – 4 January 1941) was a French-Jewish philosopher who was influential in the tradition of continental philosophy, especially during the first half of the 20th century until the Second World War. Bergson is known for his arguments that processes of immediate experience and intuition are more significant than abstract rationalism and science for understanding reality. He was awarded the 1927 Nobel Prize in Literature "in recognition of his rich and vitalizing ideas and the brilliant skill with which they have been presented". In 1930 France awarded him its highest honour, the Grand-Croix de la Legion d'honneur. Bergson's great popularity created a controversy in France where his views were seen as opposing the secular and scientific attitude adopted by the Republic's officials. Bergson was born in the Rue Lamartine in Paris, not far from the Palais Garnier (the old Paris opera house) in 1859. His father, the pianist Michał Bergson, was of a Polish Jewish background (originally bearing the name Bereksohn). His great-grandmother, Temerl Bergson, was a well-known patroness and benefactor of Polish Jewry, especially those associated with the Hasidic movement. His mother, Katherine Levison, daughter of a Yorkshire doctor, was from an English and Irish Jewish background. The Bereksohns were a famous Jewish entrepreneurial family of Polish descent. Henri Bergson's great-great-grandfather, Szmul Jakubowicz Sonnenberg, called Zbytkower, was a prominent banker and a protégé of Stanisław II Augustus, King of Poland from 1764 to 1795. Henri Bergson's family lived in London for a few years after his birth, and he obtained an early familiarity with the English language from his mother. Before he was nine, his parents settled in France, Henri becoming a naturalized French citizen. Henri Bergson married Louise Neuberger, a cousin of Marcel Proust, in 1891. (The novelist served as best man at Bergson's wedding.) Henri and Louise Bergson had a daughter, Jeanne, born deaf in 1896. Bergson's sister, Mina Bergson (also known as Moina Mathers), married the English occult author Samuel Liddell MacGregor Mathers, a founder of the Hermetic Order of the Golden Dawn, and the couple later relocated to Paris as well. In 1900 the Collège de France selected Bergson to a Chair of Greek and Roman Philosophy, which he held until 1904. He then replaced Gabriel Tarde in the Chair of Modern Philosophy, which he held until 1920. The public attended his open courses in large numbers. Bergson attended the Lycée Fontanes (known as the Lycée Condorcet 1870–1874 and 1883–present) in Paris from 1868 to 1878. He had previously received a Jewish religious education. Between 14 and 16, however, he lost his faith. According to Hude (1990), this moral crisis is tied to his discovery of the theory of evolution, according to which humanity shares common ancestry with modern primates, a process sometimes construed as not needing a creative deity. While at the lycée Bergson won a prize for his scientific work and another, in 1877 when he was eighteen, for the solution of a mathematical problem. His solution was published the following year in Nouvelles Annales de Mathématiques. It was his first published work. After some hesitation as to whether his career should lie in the sphere of the sciences or that of the humanities, he decided in favour of the latter, to the dismay of his teachers. When he was nineteen, he entered the École Normale Supérieure. During this period, he read Herbert Spencer. He obtained there the degree of licence ès lettres, and this was followed by that of agrégation de philosophie in 1881 from the University of Paris. The same year he received a teaching appointment at the lycée in Angers, the ancient capital of Anjou. Two years later he settled at the Lycée Blaise-Pascal (Clermont-Ferrand) [fr] in Clermont-Ferrand, capital of the Puy-de-Dôme département. The year after his arrival at Clermont-Ferrand Bergson displayed his ability in the humanities by the publication of an edition of extracts from Lucretius, with a critical study of the text and of the materialist cosmology of the poet (1884), a work whose repeated editions[which?] attest to its value in promoting Classics among French youth. While teaching and lecturing in this part of his country (the Auvergne region), Bergson found time for private study and original work. He crafted his dissertation Time and Free Will, which was submitted, along with a short Latin thesis on Aristotle (Quid Aristoteles de loco senserit, "On the Concept of Place in Aristotle"), for his doctoral degree which was awarded by the University of Paris in 1889. The work was published in the same year by Félix Alcan. He also gave courses in Clermont-Ferrand on the Pre-Socratics, in particular on Heraclitus. Bergson settled again in Paris in 1888, and after teaching for some months at the municipal college, known as the College Rollin, he received an appointment at the Lycée Henri-Quatre, where he remained for eight years. There, he read Darwin and gave a course on his theories. Although Bergson had previously endorsed Lamarckism and its theory of the heritability of acquired characteristics, he came to prefer Darwin's hypothesis of gradual variations, which were more compatible with his continual vision of life. In 1896 he published his second major work, entitled Matter and Memory. This rather difficult work investigates the function of the brain and undertakes an analysis of perception and memory, leading up to a careful consideration of the problems of the relation of body and mind. Bergson had spent years of research in preparation for each of his three large works. This is especially obvious in Matter and Memory, where he showed a thorough acquaintance with the extensive pathological investigations which had been carried out during the period. In 1898 Bergson became maître de conférences at his alma mater, École Normale Supérieure, and later in the same year received a promotion to a Professorship. The year 1900 saw him installed as Professor at the Collège de France, where he accepted the Chair of Greek and Roman Philosophy in succession to Charles Lévêque [fr]. At the first International Congress of Philosophy, held in Paris during the first five days of August 1900, Bergson read a short, but important, paper, "Psychological Origins of the Belief in the Law of Causality" (Sur les origines psychologiques de notre croyance à la loi de causalité). In 1900 Felix Alcan published a work which had previously appeared in the Revue de Paris, entitled Laughter (Le rire), one of the most important of Bergson's minor productions. This essay on the meaning of comedy stemmed from a lecture which he had given in his early days in the Auvergne. The study of it is essential to an understanding of Bergson's views of life, and its passages dealing with the place of the artistic in life are valuable. The main thesis of the work is that laughter is a corrective evolved to make social life possible for human beings. We laugh at people who fail to adapt to the demands of society if it seems their failure is akin to an inflexible mechanism. Comic authors have exploited this human tendency to laugh in various ways, and what is common to them is the idea that the comic consists in there being "something mechanical encrusted on the living". In 1901 the Académie des sciences morales et politiques elected Bergson as a member, and he became a member of the Institute. In 1903 he contributed to the Revue de métaphysique et de morale a very important essay entitled Introduction to Metaphysics (Introduction à la metaphysique), which is useful as a preface to the study of his three large books. He detailed in this essay his philosophical program, realized in the Creative Evolution. On the death of Gabriel Tarde, the sociologist and philosopher, in 1904, Bergson succeeded him in the Chair of Modern Philosophy. From 4 to 8 September of that year he visited Geneva, attending the Second International Congress of Philosophy, when he lectured on The Mind and Thought: A Philosophical Illusion (Le cerveau et la pensée: une illusion philosophique). An illness prevented his visiting Germany from attending the Third Congress held at Heidelberg. His third major work, Creative Evolution, the most widely known and most discussed of his books, appeared in 1907. Pierre Imbart de la Tour remarked that Creative Evolution was a milestone of new direction in thought. By 1918, Alcan, the publisher, had issued twenty-one editions, making an average of two editions per annum for ten years. Following the appearance of this book, Bergson's popularity increased enormously, not only in academic circles but among the general reading public. At that time, Bergson had already made an extensive study of biology including the theory of fecundation (as shown in the first chapter of the Creative Evolution), which had only recently emerged, ca. 1885 – no small feat for a philosopher specializing in the history of philosophy, in particular Greek and Roman philosophy. He also most certainly had read, apart from Darwin, Haeckel, from whom he retained his idea of a unity of life and of the ecological solidarity between all living beings, as well as Hugo de Vries, from whom he quoted his mutation theory of evolution (which he opposed, preferring Darwin's gradualism). He also quoted Charles-Édouard Brown-Séquard, the successor of Claude Bernard at the Chair of Experimental Medicine in the Collège de France, etc. Bergson served as a juror with Florence Meyer Blumenthal in awarding the Prix Blumenthal, a grant given between 1919 and 1954 to painters, sculptors, decorators, engravers, writers, and musicians. So modest and unpretending a man but such a genius intellectually! I have the strongest suspicions that the tendency which he has brought to a focus, will end by prevailing, and that the present epoch will be a sort of turning point in the history of philosophy. As early as 1880, James had contributed an article in French to the periodical La Critique philosophique, of Renouvier and Pillon, entitled Le Sentiment de l'Effort. Four years later, a couple of articles by him appeared in the journal Mind: "What is an Emotion?" and "On some Omissions of Introspective Psychology". Bergson quoted the first two of these articles in his 1889 work, Time and Free Will. In the following years, 1890–91 appeared the two volumes of James's monumental work, The Principles of Psychology, in which he refers to a pathological phenomenon observed by Bergson. Some writers, taking merely these dates into consideration and overlooking the fact that James's investigations had been proceeding since 1870 (registered from time to time by various articles which culminated in "The Principles"), have mistakenly dated Bergson's ideas as earlier than James's. It has been suggested[by whom?] that Bergson owes the root ideas of his first book to the 1884 article by James, "On Some Omissions of Introspective Psychology," which he neither refers to nor quotes. This article deals with the conception of thought as a stream of consciousness, which intellect distorts by framing into concepts. Bergson replied to this insinuation by denying that he had any knowledge of the article by James when he wrote Les données immédiates de la conscience. The two thinkers appear to have developed independently until almost the close of the century. They are further apart in their intellectual position than is frequently supposed. Both have succeeded in appealing to audiences far beyond the purely academic sphere, but only in their mutual rejection of "intellectualism" as decisive as their actual agreement. Although James was slightly ahead in the development and enunciation of his ideas, he confessed that he was baffled by many of Bergson's notions. James certainly neglected many of the deeper metaphysical aspects of Bergson's thought, which did not harmonize with his own, and are even in direct contradiction. In addition to this, Bergson can hardly be considered a pragmatist. For him, "utility," far from being a test of truth, was, in fact, the reverse: a synonym for error. I have been re-reading Bergson's books, and nothing that I have read for years has so excited and stimulated my thoughts. I am sure that his philosophy has a great future; it breaks through old frameworks and brings things to a solution from which new crystallizations can be reached. The influence of Bergson had led James "to renounce the intellectualist method and the current notion that logic is an adequate measure of what can or cannot be". It had induced him, he continued, "to give up logic, squarely and irrevocably" as a method, for he found that "reality, life, experience, concreteness, immediacy, use what word you will, exceeds our logic, overflows, and surrounds it". These remarks, which appeared in James's book A Pluralistic Universe in 1909, impelled many English and American readers to investigate Bergson's philosophy for themselves, but no English translations of Bergson's major work had yet appeared. James, however, encouraged and assisted Arthur Mitchell in preparing an English translation of Creative Evolution. In August 1910, James died. It was his intention, had he lived to see the translation finished, to introduce it to the English reading public by a prefatory note of appreciation. In the following year, the translation was completed and still greater interest in Bergson and his work was the result. By coincidence, in that same year (1911), Bergson penned a preface of sixteen pages entitled Truth and Reality for the French translation of James's book, Pragmatism. In it, he expressed sympathetic appreciation of James's work, together with certain important reservations. From 5 to 11 April, Bergson attended the Fourth International Congress of Philosophy held at Bologna, in Italy, where he gave an address on "Philosophical Intuition". In response to invitations he visited England in May of that year, and on several subsequent occasions. These visits were well received. [by whom?] His speeches offered new perspectives[which?] and elucidated many passages in his three major works: Time and Free Will, Matter and Memory, and Creative Evolution. Although necessarily brief statements, they developed and enriched the ideas in his books and clarified for English audiences the fundamental principles of his philosophy. In May 1911 Bergson gave two lectures entitled The Perception of Change (La perception du changement) at the University of Oxford. The Clarendon Press published these in French in the same year. His talks were concise and lucid, leading students and the general reader to his other, longer writings. Oxford later conferred on him the degree of Doctor of Science. Two days later he delivered the Huxley Lecture at the University of Birmingham, taking for his subject Life and Consciousness. This subsequently appeared in The Hibbert Journal (October 1911), and since revised, is the first essay in the collected volume Mind-Energy (L'Énergie spirituelle). In October he again traveled to England, where he had an enthusiastic reception, and delivered at University College London four lectures on La Nature de l'Âme [The nature of the soul]. In 1913 Bergson visited the United States of America at the invitation of Columbia University, New York, and lectured in several American cities, where very large audiences welcomed him. In February, at Columbia University, he lectured both in French and English, taking as his subjects: Spirituality and Freedom and The Method of Philosophy. Being again in England in May of the same year, he accepted the Presidency of the British Society for Psychical Research, and delivered to the Society an address on Phantoms of Life and Psychic Research (Fantômes des vivants et recherche psychique). Meanwhile, his popularity increased, and translations of his works began to appear in a number of languages: English, German, Italian, Danish, Swedish, Hungarian, Polish, and Russian. In 1914 Bergson's fellow-countrymen honoured him by his election as a member of the Académie française. He was also made President of the Académie des Sciences morales et politiques, and in addition, he became Officier de la Légion d'honneur, and Officier de l'Instruction publique. Bergson found disciples of many types. In France movements such as neo-Catholicism and Modernism on the one hand and syndicalism on the other endeavoured to absorb and appropriate for their own ends some central ideas of his teaching. The continental organ of socialist and syndicalist theory, Le Mouvement socialiste, portrayed the realism of Karl Marx and Pierre-Joseph Proudhon as hostile to all forms of intellectualism, and argued, therefore, that supporters of Marxist socialism should welcome a philosophy such as that of Bergson. Other writers, in their eagerness, claimed that the thought of the holder of the Chair of Philosophy at the Collège de France, and the aims of the Confédération Générale du Travail and the Industrial Workers of the World were in essential agreement. While social revolutionaries endeavoured to make the most out of Bergson, many religious leaders, particularly the more liberal-minded theologians of all creeds, e.g., the Modernists and Neo-Catholic Party in his own country, showed a keen interest in his writings, and many of them found encouragement and stimulus in his work. The Roman Catholic Church, however, banned Bergson's three books on the charge of pantheism (that is, of conceiving of God as immanent to his Creation and of being himself created in the process of the Creation). They were placed on the Index of prohibited books (Decree of 1 June 1914). In 1914 the Scottish universities arranged for Bergson to give the famous Gifford Lectures, planning one course for the spring and another for the autumn. Bergson delivered the first course, consisting of eleven lectures, under the title of The Problem of Personality, at the University of Edinburgh in the spring of that year. The course of lectures planned for the autumn months had to be abandoned because of the outbreak of war. Bergson was not, however, silent during the conflict, and he gave some inspiring addresses. As early as 4 November 1914, he wrote an article entitled Wearing and Nonwearing forces (La force qui s'use et celle qui ne s'use pas), which appeared in that unique and interesting periodical of the poilus, Le Bulletin des Armées de la République Française. A presidential address, The Meaning of the War, was delivered in December 1914, to the Académie des sciences morales et politiques. Bergson contributed also to the publication arranged by The Daily Telegraph in honour of King Albert I of the Belgians, King Albert's Book (Christmas, 1914). In 1915 he was succeeded in the office of President of the Académie des Sciences morales et politiques by Alexandre Ribot, and then delivered a discourse on "The Evolution of German Imperialism". Meanwhile, he found time to issue at the request of the Minister of Public Instruction a brief summary of French Philosophy. Bergson did a large amount of traveling and lecturing in America during the war. He participated in the negotiations which led to the entry of the United States in the war. He was there when the French Mission under René Viviani paid a visit in April and May 1917, following upon America's entry into the conflict. Viviani's book La Mission française en Amérique (1917), contains a preface by Bergson. Early in 1918 the Académie française received Bergson officially when he took his seat among "The Select Forty" as successor to Emile Ollivier (the author of the historical work L'Empire libéral). A session was held in January in his honour at which he delivered an address on Ollivier. In the war, Bergson saw the conflict of Mind and Matter, or rather of Life and Mechanism; and thus he shows us the central idea of his own philosophy in action. To no other philosopher has it fallen, during his lifetime, to have his philosophical principles so vividly and so terribly tested. As many of Bergson's contributions to French periodicals remained relatively inaccessible, he agreed to the request of his friends[which?] to have such works collected and published in two volumes. The first of these was being planned when war broke out. The conclusion of strife was marked by the appearance of a delayed volume in 1919. It bears the title Spiritual Energy: Essays and Lectures (reprinted as Mind-Energy – L'Énergie spirituelle: essais et conférences). The advocate of Bergson's philosophy in England, Wildon Carr, prepared an English translation under the title Mind-Energy. The volume opens with the Huxley Memorial Lecture of 1911, "Life and Consciousness", in a revised and developed form under the title "Consciousness and Life". Signs of Bergson's growing interest in social ethics and in the idea of a future life of personal survival are manifested. The lecture before the Society for Psychical Research is included, as is also the one given in France, L'Âme et le Corps, which contains the substance of the four London lectures on the Soul. The seventh and last article is a reprint of Bergson's famous lecture to the Congress of Philosophy at Geneva in 1904, The Psycho-Physiological Paralogism (Le paralogisme psycho-physiologique), which now appears as Le cerveau et la pensée: une illusion philosophique. Other articles are on the False Recognition, on Dreams, and Intellectual Effort. The volume is a most welcome production and serves to bring together what Bergson wrote on the concept of mental force, and on his view of "tension" and "detension" as applied to the relation of matter and mind. In June 1920, the University of Cambridge honoured him with the degree of Doctor of Letters. In order that he might devote his full-time to the great new work he was preparing on ethics, religion, and sociology, the Collège de France relieved Bergson of the duties attached to the Chair of Modern Philosophy there. He retained the chair, but no longer delivered lectures, his place being taken by his disciple, the mathematician and philosopher Édouard Le Roy, who supported a conventionalist stance on the foundations of mathematics, which was adopted by Bergson. Le Roy, who also succeeded to Bergson at the Académie française and was a fervent Catholic, extended to revealed truth his conventionalism, leading him to privilege faith, heart and sentiment to dogmas, speculative theology and abstract reasoning. Like Bergson's, his writings were placed on the Index by the Vatican. In the fall of 1922 Bergson's book Durée et simultanéité, a propos de la theorie d'Einstein (Duration and Simultaneity: Bergson and the Einsteinian Universe) was published. Earlier in the spring Einstein had come to the French Society of Philosophy and briefly replied to a short speech made by Bergson. The book has been often considered as one of his worst, many alleging that his knowledge of physics was insufficient, and that the book did not follow up contemporary developments on physics. (But in "Einstein and the Crisis of Reason", a leading French philosopher, Maurice Merleau-Ponty, accused Einstein of failing to grasp Bergson's argument. This argument, Merleau-Ponty says, which concerns not the physics of special relativity but its philosophical foundations, addresses paradoxes caused by popular interpretations and misconceptions about the theory, including Einstein's own.) It was not published in the 1951 Edition du Centenaire in French, which contained all of his other works, and was only published later in a work gathering different essays, titled Mélanges. Duration and simultaneity took advantage of Bergson's experience at the League of Nations, where he presided from 1920 to 1925 over the International Committee on Intellectual Cooperation (the ancestor of UNESCO, and which included Einstein, Marie Curie, etc.).. While living with his wife and daughter in a modest house in a quiet street near the Porte d'Auteuil in Paris, Bergson won the Nobel Prize for Literature in 1927 for having written The Creative Evolution. Because of serious rheumatics ailments, he could not travel to Stockholm, and sent instead a text subsequently published in La Pensée et le mouvant. He was elected a Foreign Honorary Member of the American Academy of Arts and Sciences in 1928. After his retirement from the Collège, Bergson began to fade into obscurity: he suffered from a degenerative illness (rheumatism, which left him half paralyzed). He completed his new work, The Two Sources of Morality and Religion, which extended his philosophical theories to the realms of morality, religion, and art, in 1935. It was respectfully received by the public and the philosophical community, but all by that time realized that Bergson's days as a philosophical luminary were past. He was, however, able to reiterate his core beliefs near the end of his life, by renouncing all of the posts and honours previously awarded him, rather than accept exemption from the antisemitic laws imposed by the Vichy government. On 3 January 1941 Bergson died in occupied Paris from bronchitis. A Roman Catholic priest said prayers at his funeral per his request. Bergson is buried in the Cimetière de Garches, Hauts-de-Seine. Bergson rejected what he saw as the overly mechanistic predominant view of causality (as expressed in, say, finalism). He argued that we must allow space for free will to unfold in an autonomous and unpredictable fashion. While Kant saw free will as something beyond time and space and therefore ultimately a matter of faith, Bergson attempted to redefine the modern conceptions of time, space, and causality in his concept of Duration, making room for a tangible marriage of free will with causality. Seeing Duration as a mobile and fluid concept, Bergson argued that one cannot understand Duration through "immobile" analysis, but only through experiential, first-person intuition. Bergson considers the appearance of novelty as a result of pure undetermined creation, instead of as the predetermined result of mechanistic forces. His philosophy emphasises pure mobility, unforeseeable novelty, creativity and freedom; thus one can characterize his system as a process philosophy. It touches upon such topics as time and identity, free will, perception, change, memory, consciousness, language, the foundation of mathematics and the limits of reason. Criticizing Kant's theory of knowledge exposed in the Critique of Pure Reason and his conception of truth – which he compares to Plato's conception of truth as its symmetrical inversion (order of nature/order of thought) – Bergson attempted to redefine the relations between science and metaphysics, intelligence and intuition, and insisted on the necessity of increasing thought's possibility through the use of intuition, which, according to him, alone approached a knowledge of the absolute and of real life, understood as pure duration. Because of his (relative) criticism of intelligence, he makes a frequent use of images and metaphors in his writings in order to avoid the use of concepts, which (he considers) fail to touch the whole of reality, being only a sort of abstract net thrown on things. For instance, he says in The Creative Evolution (chap. III) that thought in itself would never have thought it possible for the human being to swim, as it cannot deduce swimming from walking. For swimming to be possible, man must throw itself in water, and only then can thought consider swimming as possible. Intelligence, for Bergson, is a practical faculty rather than a pure speculative faculty, a product of evolution used by man to survive. If metaphysics is to avoid "false problems", it should not extend the abstract concepts of intelligence to pure speculation, but rather use intuition. The Creative Evolution in particular attempted to think through the continuous creation of life, and explicitly pitted itself against Herbert Spencer's evolutionary philosophy. Spencer had attempted to transpose Charles Darwin's theory of evolution in philosophy and to construct a cosmology based on this theory (Spencer also coined the expression "survival of the fittest"). Bergson disputed what he saw as Spencer's mechanistic philosophy. Bergson's Lebensphilosophie (philosophy of life) can be seen as a response to the mechanistic philosophies of his time, but also to the failure of finalism. Indeed, he considers that finalism is unable to explain "duration" and the "continuous creation of life", as it only explains life as the progressive development of an initially determined program – a notion which remains, for example, in the expression of a "genetic program"; such a description of finalism was adopted, for instance, by Leibniz. It clearly announces Alfred North Whitehead's. Bergson regarded planning beforehand for the future as impossible, since time itself unravels unforeseen possibilities. Indeed, one could always explain a historical event retrospectively by its conditions of possibility. But, in the introduction to the Pensée et le mouvant, he explains that such an event created retrospectively its causes, taking the example of the creation of a work of art, for example a symphony: it was impossible to predict what would be the symphony of the future, as if the musician knew what symphony would be the best for his time, he would realize it. In his words, the effect created its cause. Henceforth, he attempted to find a third way between mechanism and finalism, through the notion of an original impulse, the élan vital, in life, which dispersed itself through evolution into contradictory tendencies (he substituted to the finalist notion of a teleological aim a notion of an original impulse). The foundation of Henri Bergson's philosophy, his theory of Duration, he discovered when trying to improve the inadequacies of Herbert Spencer's philosophy. Bergson introduced Duration as a theory of time and consciousness in his doctoral thesis Time and Free Will: An Essay on the Immediate Data of Consciousness as a response to another of his influences: Immanuel Kant. Kant believed that free will (better perceived as The Will) could only exist outside of time and space, indeed the only non-determined aspect of our private existence in the universe, separate to water cycles, mathematics and mortality. However, we could therefore not know whether or not it exists, and that it is nothing but a pragmatic faith. Bergson responded that Kant, along with many other philosophers, had confused time with its spatial representation. In reality, Bergson argued, Duration is unextended yet heterogeneous, and so its parts cannot be juxtaposed as a succession of distinct parts, with one causing the other. Based on this he concluded that determinism is an impossibility and free will pure mobility, which is what Bergson identified as being the Duration. Duration, as defined by Bergson, then is a unity and a multiplicity, but, being mobile, it cannot be grasped through immobile concepts. Bergson hence argues that one can grasp it only through his method of intuition. Two images from Henri Bergson's An Introduction to Metaphysics may help one to grasp Bergson's term intuition, the limits of concepts, and the ability of intuition to grasp the absolute. The first image is that of a city. Analysis, or the creation of concepts through the divisions of points of view, can only ever give us a model of the city through a construction of photographs taken from every possible point of view, yet it can never give us the dimensional value of walking in the city itself. One can only grasp this through intuition; likewise the experience of reading a line of Homer. One may translate the line and pile commentary upon commentary, but this commentary too shall never grasp the simple dimensional value of experiencing the poem in its originality itself. The method of intuition, then, is that of getting back to the things themselves. Hereby lies the stumbling block of vitalist theories ... It is thus in vain that one pretends to reduce finality to the individuality of the living being. If there is finality in the world of life, it encompasses the whole of life in one indivisible embrace. In Laughter: An Essay on the Meaning of the Comic, Bergson develops a theory not of laughter itself but of how laughter can be provoked (see his objection to Delage, published in the 23rd edition of the essay). He describes the process of laughter (refusing to give a conceptual definition which would not approach its reality), used in particular by comics and clowns, as caricature of the mechanistic nature of humans (habits, automatic acts, etc. ), one of the two tendencies of life (degradation towards inert matter and mechanism, and continual creation of new forms). However, Bergson warns us that laughter's criterion of what should be laughed at is not a moral criterion and that it can in fact cause serious damage to a person's self-esteem. This essay made his opposition to the Cartesian theory of the animal-machine obvious. From his first publications, Bergson's philosophy attracted strong criticism from different quarters, although he also became very popular and durably influenced French philosophy. The mathematician Édouard Le Roy became Bergson's main disciple. Nonetheless, Suzanne Guerlac has argued that his institutional position at the Collège de France, delivering lectures to a general audience, may have retarded the systematic reception of his thought: "Bergson achieved enormous popular success in this context, often due to the emotional appeal of his ideas. But he did not have the equivalent of graduate students who might have become rigorous interpreters of his thought. Thus Bergson's philosophy—in principle open and nonsystematic—was easily borrowed piecemeal and altered by enthusiastic admirers". Alfred North Whitehead acknowledged Bergson's influence on his process philosophy in his 1929 Process and Reality. However, Bertrand Russell, Whitehead's collaborator on Principia Mathematica, was not so entranced by Bergson's philosophy. Although acknowledging Bergson's literary skills, Russell saw Bergson's arguments at best as persuasive or emotive speculation but not at all as any worthwhile example of sound reasoning or philosophical insight. The epistemologist Gaston Bachelard explicitly alluded to him in the last pages of his 1938 book The Formation of the Scientific Mind. Others influenced by Bergson include Vladimir Jankélévitch, who wrote a book on him in 1931, Pierre Teilhard de Chardin, and Gilles Deleuze who wrote Le bergsonisme in 1966. Bergson also influenced the phenomenology of Maurice Merleau-Ponty and Emmanuel Levinas, although Merleau-Ponty had reservations about Bergson's philosophy. The Greek author Nikos Kazantzakis studied under Bergson in Paris and his writing and philosophy were profoundly influenced as a result. 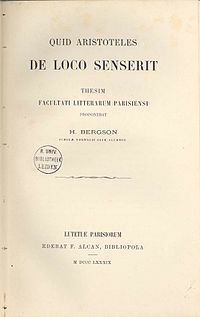 Many writers of the early 20th century criticized Bergson's intuitionism, indeterminism, psychologism and interpretation of the scientific impulse. Those who explicitly criticized Bergson, either in published articles or in letters, included Bertrand Russell George Santayana, G. E. Moore, Ludwig Wittgenstein, Martin Heidegger, Julien Benda, T. S. Eliot, Wyndham Lewis, Wallace Stevens, Paul Valéry, André Gide, Jean Piaget, Marxist philosophers Theodor W. Adorno, Lucio Colletti, Jean-Paul Sartre, and Georges Politzer, as well as Maurice Blanchot, American philosophers such as Irving Babbitt, Arthur Lovejoy, Josiah Royce, The New Realists (Ralph B. Perry, E. B. Holt, and William Pepperell Montague), The Critical Realists (Durant Drake, Roy W. Sellars, C. A. Strong, and A. K. Rogers), Daniel-Henry Kahnweiler, Roger Fry (see his letters), Julian Huxley (in Evolution: The Modern Synthesis) and Virginia Woolf (for the latter, see Ann Banfield, The Phantom Table). The Vatican accused Bergson of pantheism, while free-thinkers[who?] (who formed a large part of the teachers and professors of the French Third Republic) accused him of spiritualism. Still others have characterized his philosophy as a materialist emergentism – Samuel Alexander and C. Lloyd Morgan explicitly claimed Bergson as their forebear. According to Henri Hude (1990, II, p. 142), who supports himself on the whole of Bergson's works as well as his now published courses, accusing him of pantheism is a "counter-sense". Hude alleges that a mystical experience, roughly outlined at the end of Les Deux sources de la morale et de la religion, is the inner principle of his whole philosophy, although this has been contested by other commentators. Charles Sanders Peirce took strong exception to those who associated him with Bergson. In response to a letter comparing his work with that of Bergson he wrote, "a man who seeks to further science can hardly commit a greater sin than to use the terms of his science without anxious care to use them with strict accuracy; it is not very gratifying to my feelings to be classed along with a Bergson who seems to be doing his utmost to muddle all distinctions." William James's students resisted the assimilation of his work to that of Bergson. See, for example, Horace Kallen's book on the subject James and Bergson. As Jean Wahl described the "ultimate disagreement" between James and Bergson in his System of Metaphysics: "for James, the consideration of action is necessary for the definition of truth, according to Bergson, action ... must be kept from our mind if we want to see the truth"[page needed]. Gide even went so far as to say that future historians will overestimate Bergson's influence on art and philosophy just because he was the self-appointed spokesman for "the spirit of the age". the possibility of a new and unaccountable fact appearing at any time," he writes in his book on Hermann Lotze, "does not practically affect the method of investigation; ... the only thing given up is the hope that these hypotheses may ever be adequate to the reality and cover the process of nature without leaving a remainder. This is no great renunciation; for that consummation of science ... is by no one really expected. According to Santayana and Russell, Bergson projected false claims onto the aspirations of scientific method, claims which Bergson needed to make in order to justify his prior moral commitment to freedom. Russell takes particular exception to Bergson's understanding of number in chapter two of Time and Free-will. According to Russell, Bergson uses an outmoded spatial metaphor ("extended images") to describe the nature of mathematics as well as logic in general. "Bergson only succeeds in making his theory of number possible by confusing a particular collection with the number of its terms, and this again with number in general", writes Russell (see The Philosophy of Bergson[page needed] and A History of Western Philosophy[page needed]). Furthermore, writers such as Russell, Wittgenstein, and James saw élan vital as a projection of subjectivity onto the world. The external world, according to certain[which?] theories of probability, provides less and less indeterminism with further refinement of scientific method. In brief, one should not confuse the moral, psychological, subjective demand for the new, the underivable and the unexplained with the universe. One's subjective sense of duration differs the (non-human) world, a difference which, according to the ancient materialist Lucretius should not be characterized as either one of becoming or being, creation or destruction (De Rerum Natura). Suzanne Guerlac has argued that the more recent resurgence of scholarly interest in Bergson is related to the growing influence of his follower Deleuze within continental philosophy: "If there is a return to Bergson today, then, it is largely due to Gilles Deleuze whose own work has etched the contours of the New Bergson. This is not only because Deleuze wrote about Bergson; it is also because Deleuze's own thought is deeply engaged with that of his predecessor, even when Bergson is not explicitly mentioned." Leonard Lawlor and Valentine Moulard agree with Guerlac that "the recent revitalization of Bergsonism ... is almost entirely due to Deleuze." They explain that Bergson's concept of multiplicity "is at the very heart of Deleuze's thought, and duration is the model for all of Deleuze's 'becomings.' The other aspect that attracted Deleuze, which is indeed connected to the first, is Bergson's criticism of the concept of negation in Creative Evolution. ... Thus Bergson became a resource in the criticism of the Hegelian dialectic, the negative." Ilya Prigogine acknowledged Bergson's influence at his Nobel Prize reception lecture: "Since my adolescence, I have read many philosophical texts, and I still remember the spell L’évolution créatrice cast on me. More specifically, I felt that some essential message was embedded, still to be made explicit, in Bergson‘s remark: 'The more deeply we study the nature of time, the better we understand that duration means invention, creation of forms, continuous elaboration of the absolutely new.'" Several Hindu authors have found parallels to Hindu philosophy in Bergson's thought. The integrative evolutionism of Sri Aurobindo, an Indian philosopher from the early 20th century, has many similarities to Bergson's philosophy. Whether this represents a direct influence of Bergson is disputed, although Aurobindo was familiar with many Western philosophers. K Narayanaswami Aiyer, a member of the Theosophical Society, published a pamphlet titled "Professor Bergson and the Hindu Vedanta", where he argued that Bergson's ideas on matter, consciousness, and evolution were in agreement with Vedantic and Puranic explanations. Nalini Kanta Brahma, Marie Tudor Garland and Hope Fitz are other authors who have comparatively evaluated Hindu and Bergsonian philosophies, especially in relation to intuition, consciousness and evolution. Bergson, H.; Time and Free Will: An Essay on the Immediate Data of Consciousness (Essai sur les données immédiates de la conscience, 1889). Allen & Unwin 1910, Dover Publications 2001: ISBN 0-486-41767-0 – Bergson's doctoral dissertation. Bergson, H.; Matter and Memory (Matière et mémoire, 1896). Swan Sonnenschein 1911, Zone Books 1990: ISBN 0-942299-05-1, Dover Publications 2004: ISBN 0-486-43415-X. Bergson, H.; Laughter: An Essay on the Meaning of the Comic (Le rire, 1900). Green Integer 1998: ISBN 1-892295-02-4, Dover Publications 2005: ISBN 0-486-44380-9. Bergson, H.; Creative Evolution (L'Évolution créatrice, 1907). Henry Holt and Company 1911, University Press of America 1983: ISBN 0-8191-3553-4, Dover Publications 1998: ISBN 0-486-40036-0, Kessinger Publishing 2003: ISBN 0-7661-4732-0, Cosimo 2005: ISBN 1-59605-309-7. Bergson, H.; Mind-energy (L'Énergie spirituelle, 1919). McMillan 1920. – a collection of essays and lectures. On Archive.org. Bergson, H.; Duration and Simultaneity: Bergson and the Einsteinian Universe (Durée et simultanéité, 1922). Clinamen Press Ltd 1999. ISBN 1-903083-01-X. Bergson, H.; The Two Sources of Morality and Religion (Les Deux Sources de la Morale et de la Religion, 1932). University of Notre Dame Press 1977. ISBN 0-268-01835-9. On Archive.org. Bergson, H.; The Creative Mind: An Introduction to Metaphysics (La Pensée et le mouvant, 1934). Citadel Press 1946: ISBN 0-8065-2326-3 – essay collection, sequel to Mind-Energy, including 1903's "An Introduction to Metaphysics." ^ John Ó Maoilearca, Beth Lord (eds. ), The Continuum Companion to Continental Philosophy, Bloomsbury Academic, 2009, p. 204. ^ R. William Rauch, Politics and Belief in Contemporary France: Emmanuel Mounier and Christian Democracy, 1932–1950, Springer, 2012, p. 67. ^ Merquior, J. G. (1987). Foucault (Fontana Modern Masters series), University of California Press, ISBN 0-520-06062-8. ^ "The Nobel prize in Literature". Retrieved 15 November 2010. ^ Gelber, Nathan Michael (1 January 2007). "Bergson". Encyclopaedia Judaica. Archived from the original on 29 March 2015. Retrieved 7 December 2015. (Subscription required (help)). ^ Dynner, Glenn (2008). Men of Silk: The Hasidic Conquest of Polish Jewish Society. Oxford University Press. pp. 104–105. ISBN 019538265X. ^ Suzanne Guerlac, Thinking in Time: An Introduction to Henri Bergson, Ithaca, New York: Cornell University Press, 2007, p. 9. ^ "Nouvelles Annales de Mathématiques". 2 (17). Paris. 1878: 268. Retrieved 15 March 2018. ^ Henri Bergson: Key Writings, ed. Keith Ansell Pearson and John Mullarkey. London: Continuum, 2002, p. ix. ^ Bergson, Henri (1911). La perception du changement; conférences faites à l'Université d'Oxford les 26 et 27 mai 1911 [The perception of change: lectures delivered at the University of Oxford on 26 and 27 May 1911] (in French). Oxford: Clarendon. p. 37. ^ King Albert's book: a tribute to the Belgian king and people from representative men and women throughout the world. London: The Daily Telegraph. 1914. p. 187. ^ Canales J., The Physicist and the Philosopher: Einstein, Bergson and the Debate That Changed Our Understanding of Time, Princeton, Princeton Press, 2015. ^ Signs, Maurice Merleau-Ponty, trans. Richard C. McCleary, Northwestern Univ. Press, 1964. ^ On the relation between Einstein and Bergson in this Committee, see Einstein, Bergson and the Experiment that Failed: Intellectual Cooperation at the League of Nations. On the involvement of Bergson (and Einstein) in the Committee in general, see Grandjean, Martin (2018). Les réseaux de la coopération intellectuelle. La Société des Nations comme actrice des échanges scientifiques et culturels dans l'entre-deux-guerres [The Networks of Intellectual Cooperation. The League of Nations as an Actor of the Scientific and Cultural Exchanges in the Inter-War Period] (in French). Lausanne: Université de Lausanne. .
^ Quoted in: Zolli, Eugenio (2008) . Before the Dawn. Ignatius Press. p. 89. ISBN 978-1-58617-287-9. ^ Gilbert, Martin. The Second World War: A Complete History (p. 129). Rosetta Books. Kindle Edition. ^ "Henri Bergson – Philosopher – Biography". www.egs.edu. 3 January 1941. Archived from the original on 27 May 2010. Retrieved 17 February 2010. ^ Bergson explores these topics in Time and Free Will: An Essay on the Immediate Data of Consciousness, in Matter and Memory, in Creative Evolution, and in The Creative Mind: An Introduction to Metaphysics. ^ a b Henri Bergson, The Creative Mind: An Introduction to Metaphysics, pages 11 to 13. ^ a b The Stanford Encyclopedia of Philosophy, "Henri Bergson": "'Time and Free Will' has to be seen as an attack on Kant, for whom freedom belongs to a realm outside of space and time." ^ The Stanford Encyclopedia of Philosophy, "Henri Bergson": "For Bergson – and perhaps this is his greatest insight – freedom is mobility." ^ Henri Bergson, The Creative Mind: An Introduction to Metaphysics, pages 160 to 161. For a Whiteheadian use of Bergsonian intuition, see Michel Weber's Whitehead’s Pancreativism. The Basics. Foreword by Nicholas Rescher, Frankfurt / Paris, Ontos Verlag, 2006. ^ Henri Bergson's theory of laughter. A brief summary. ^ Cf. Ronny Desmet and Michel Weber (edited by), Whitehead. The Algebra of Metaphysics. Applied Process Metaphysics Summer Institute Memorandum, Louvain-la-Neuve, Éditions Chromatika, 2010 & Michel Weber, Whitehead’s Pancreativism. The Basics. Foreword by Nicholas Rescher, Frankfurt / Paris, ontos verlag, 2006. ^ Dermot Moran, Introduction to Phenomenology, 2000, pp. 322 and 393. ^ Merleau-Ponty, Maurice (2001). Bjelland, Andrew G.; Burke, Patrick, eds. The incarnate subject : Malebranche, Biran, and Bergson on the union of body and soul. preface by Jacques Taminiaux ; translation by Paul B. Milan. Amherst, N.Y.: Humanity Books. p. 152. ISBN 1-57392-915-8. ^ see his short book Russell, Bertrand (1977). The philosophy of Bergson. Folcroft, Pa.: Folcroft Library Editions. p. 36. ISBN 0-8414-7371-4. on the subject). ^ see his study on the author in "Winds of Doctrine"
^ see Being and Time, esp. sections 5, 10, and 82. ^ Wyndham Lewis, Time and Western Man (1927), ed. Paul Edwards, Santa Rosa, CA: Black Sparrow, 1993. ^ "The Irrational Element in Poetry." 1936. Opus Posthumous. 1957. Ed. Milton J. Bates. New York: Random House, 1990. ^ see "Hegel and Marxism"
^ Suzanne Guerlac, Thinking in Time: An Introduction to Henri Bergson, Ithaca, NY: Cornell University Press, 2006, p. 175. ^ KN Aiyer. "Professor Bergson and the Hindu Vedanta". Vasanta Press. 1910. Pages 36 – 37. ^ Marie Tudor Garland. "Hindu Mind Training". Longmans, Green and Company, 1917. Page 20. ^ Nalini Kanta Brahma. "Philosophy of Hindu Sadhana". PHI Learning Private Ltd 2008. ^ Hope K Fitz. "Intuition: Its nature and uses in human experience." Motilal Banarsidass publishers 2000. Pages 22–30. Ansell-Pearson, Keith. Philosophy and the Adventure of the Virtual: Bergson and the Time of Life. London: Routledge, 2002. Bachelard, Gaston. The Dialectic of Duration. Trans. Mary Mcallester Jones. Manchester: Clinamen Press, 2000. Bianco, Giuseppe. Après Bergson. Portrait de groupe avec philosophe. Paris, PUF, 2015. Canales, Jimena. The Physicist and the Philosopher: Einstein, Bergson and the Debate That Changed Our Understanding of Time. Princeton, Princeton Press, 2015. Deleuze, Gilles. Bergsonism. Trans. Hugh Tomlinson and Barbara Habberjam. New York: Zone Books, 1988. Grosz, Elizabeth. The Nick of Time: Politics, Evolution, and the Untimely. Durham, NC: Duke University Press, 2004. Guerlac, Suzanne. Thinking in Time: An Introduction to Henri Bergson. Ithaca, NY: Cornell University Press, 2006. Horkheimer, Max. "On Bergson's Metaphysics of Time." Trans. Peter Thomas, revised by Stewart Martin. Radical Philosophy 131 (2005) 9–19. James, William. "Bergson and his Critique of Intellectualism." In A Pluralistic Universe. Lincoln, NE: University of Nebraska Press, 1996. 223–74. Lawlor, Leonard. The Challenge of Bergsonism: Phenomenology, Ontology, Ethics. London: Continuum Press, 2003. Merleau-Ponty, Maurice. "Bergson." In In Praise of Philosophy and Other Essays. Trans. John O'Neill. Evanston, IL: Northwestern University Press, 1963. 9–32. Merleau-Ponty, Maurice. "Bergson in the Making." In Signs. Trans. Richard McCleary. Evanston, IL: Northwestern University Press, 1964. 182–91. Mullarkey, John. "Bergson and Philosophy." Edinburgh University Press, 1999. Mullarkey, John, ed. The New Bergson. Manchester and New York: Manchester University Press, 1999. Russell, Bertrand "The Philosophy of Bergson". The Monist 22 (1912): 321–47. Gontarski, Stanley E.: Bergson, Henri, in: 1914-1918-online. International Encyclopedia of the First World War. Henri Bergson, Nobel Luminaries - Jewish Nobel Prize Winners, on the Beit Hatfutsot-The Museum of the Jewish People Website.